Greek Prime Minister Alexis Tsipras is to visit Russian President Vladimir Putin on 8 April, a month earlier than planned, as the indebted eurozone member state seeks to avoid bankruptcy. 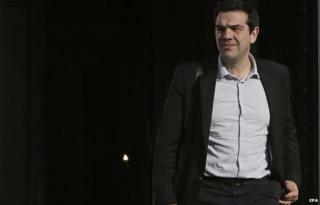 He came to power vowing to end austerity, but talks with creditors on Greek financial reforms are in trouble. Relations with one of Greece's biggest creditors, Germany, are at a low ebb. German Finance Minister Wolfgang Schaeuble has accused the new government of wrecking confidence. Greece needs the final instalment of its €240bn (£172bn; $255bn) bailout to stay afloat and in order to secure a four-month extension, the government has to give full details of its planned reforms by the end of April. The visit to Moscow, confirmed by officials, was initially reported by Ta Nea newspaper, which said that the Athens government had sought to bring forward the meeting, originally planned for 9 May, because of "stifling economic conditions" set by Europe's creditors. Greece is desperate for cash, and already the government is paying only for essentials, such as wages and pensions, while other expenses have been frozen. The government needs €1.7bn this month alone, and €4bn in total by the end of April. Mr Tsipras will make a final effort at the EU summit later this week to convince creditors to release part of the remaining bailout tranche, or at least convince the ECB to allow Greek commercial banks to buy more Treasury bills, giving in return some reforms he can safely pass in parliament. If no progress is made, his trip to Russia may come in handy, since Moscow has already said it would be willing to consider a request for a loan by Athens. The Greek leader could also play the Russian card in another way. He could tell Mrs Merkel that he will give the green light to Russian investment, in state railways, the port of Thessaloniki and other state assets that Moscow has publicly shown an interest in. These are steps the EU would be keen to avoid. Could Greece abandon the EU for Russia? As tensions increase with Greece's major European partners, Mr Tsipras is hoping to meet the head of the European Central Bank, Mario Draghi, as well as the German chancellor and the presidents of France and the European Commission on the sidelines of an EU summit on Thursday, Greek radio reports. A further important meeting with Chancellor Angela Merkel will take place next Monday, when the Greek prime minister travels to Berlin in an attempt to push for a deal to secure funding. Several ministers in Mr Tsipras's Syriza-led government have close contacts with Moscow and Foreign Minister Nikos Kotzias has openly questioned EU sanctions imposed on Russia because of its annexation of Crimea and its conduct elsewhere in eastern Ukraine.